I don’t know how he does it, I really don’t. I mean the kid is only 2. But he’s feisty and stubborn. Hmmm, don’t know where he gets that. . . 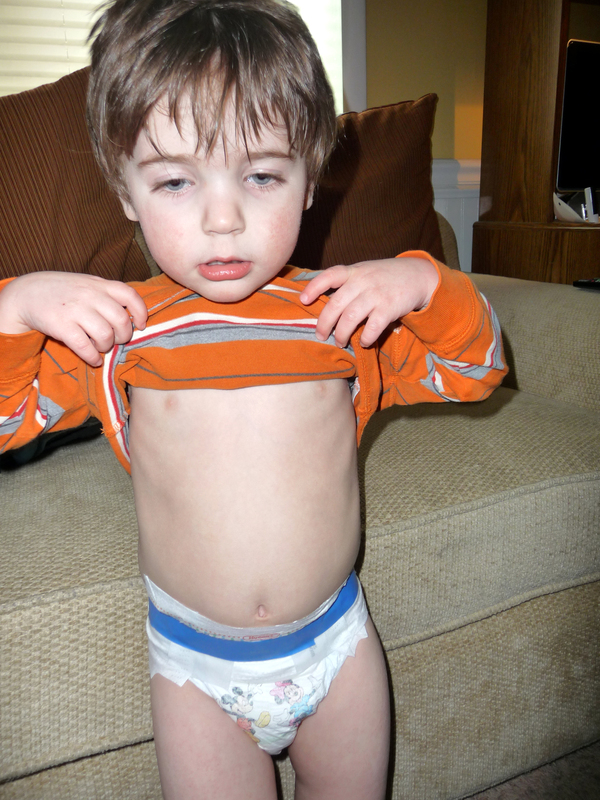 So here’s the problem: Ian likes to take his clothes off during nap time and bedtime. Ian also likes to take his diaper off during nap time and bedtime. Just wrap your mind around all the different scenarios that can occur because of that. Oh yes — the possibilities are endless. And I get all the fun during clean-up time. Yes, we seriously did that. We tried packing tape (didn’t work so well), masking tape (much better), painters blue tape (very good) and duct tape (the best). We just wrapped it around the top part of the diaper. Snug, but not so snug that he can’t breathe. And guess what? The little squirt, after many, many attempts over the course of many, many days, still managed to get his diaper off! He’s that stubborn and persistent. Blanket sleepers to the rescue! And safety pins to the rescue! We put his blanket sleeper on and then put a safety-pin through the zipper and into the fabric so he can’t unzip it and strip down to complete nakedness. Yep, he managed to somehow undo the safety-pin and strip down to complete nakedness. Did I mention he’s only 2 years old? There are some adults that have trouble with safety pins. Need I mention I’ve been doing a lot of laundry lately? More than normal. And most of them bed sheets and blankets. Super fun. So then my husband decides that the best thing to do is to put his blanket sleeper on backwards! So we did. And it was hilarious. But it was also a bit of a struggle to get his feet in. So Curtis put his feet in the right way and then turned the rest of it around, which made it twisted at the bottom by his ankles. 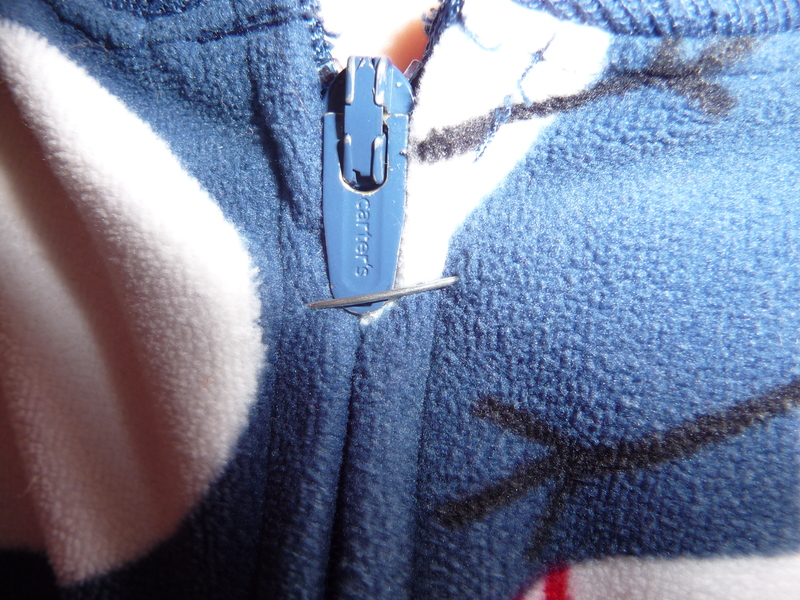 And then we safety-pinned the zipper up so he couldn’t unzip himself and strip down to complete nakedness. And he tried. Oh how he tried. He immediately tried to reach his little hands back there and pull himself free. He was unsuccessful. But it was also uncomfortable for him. Funny for us. Not so much for him. I didn’t want poor Ian to be uncomfortable every night. I’m a softy sometimes. So I came up with yet another idea. 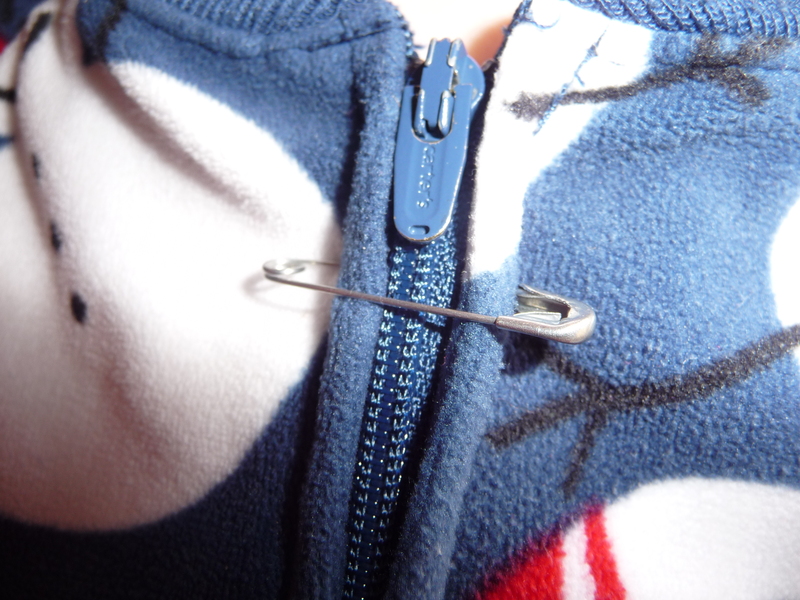 Do you see how the safety-pin is pinned inside his blanket sleeper? I don’t know why this works because you’d think he’d still be able to get his tiny fingers in there and do his magic. But he can’t when it’s backwards like that. My laundry piles are getting smaller now. It’s wonderful. I just proved that I’m more stubborn than my 2-year-old. Not sure if that’s a good thing, but it’s a good thing I figured out how to keep his diapers on. It’s a little annoying that I have to change him into his pj’s during nap time, but it’s worth it not to walk into the room and see things I don’t want to see (like poo smeared all over his bed and bedding). Sorry about the graphic images I just placed in your mind. So if you have a child that’s stubborn, keep at it. You’ll eventually find a solution. And another cool use for the safety-pin. This entry was posted in Organizing and tagged blanket sleeper, safety-pin. Bookmark the permalink. glad you outsmarted him! hope his nudist instincts leave him in later life!